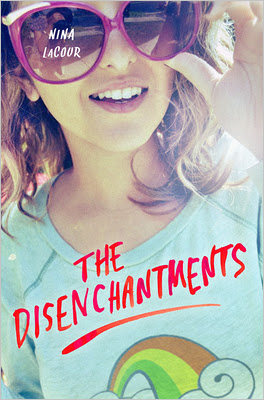 The Disenchantments wasn’t at all what I hoped and expected it to be. Lets start with the characters. You have Alexa, the one who believes in the magic eight ball. Really! Nuff said, right? Just completely mental. Meg, her sister, the one I like the best out of all the characters, is fun, considerate, kind and cool. I liked her a lot, and her music taste is the best! Who doesn’t love the Supremes? Bev is the one I didn’t like at all throughout the book, the cigarette smoker, the moody girl that doesn't tell Colby the reason why she isn’t sticking to the plan she made with him. And then we have Colby, the guy who’s the protagonist. At first I kind of got annoyed by him. I mean, get over it already. You don’t need her. Life goes on. I mean, seriously did it had to take so long for him to finally get it. Probably! I know, there was more to it, but wow he acted like his world couldn’t exist without her. Very dramatic. I wanted him to get over it already and get it on with Meg. The plot is kind of fun. I mean, the road trip is cool, but I don’t know about the places they visited. They don’t seem all that fun to me. A little bit boring actually and in the middle of nowhere. Each of the characters had their own story/little problems and to see them dealing with it was very interesting and entertaining. I also liked that even though their band sucked, they still enjoyed making music and loved performing. Doing what you love is important! So all in all an okay story for me. I didn’t fall in love with it, which I hoped, but it was still entertaining. For some reason Colby reminds me of Romeo? Like moping around forever and feeling sorry for himself? Oooh, Meg sounds like fun! Unlike Bev, who sounds annoying and too moody. The roadtrip itself sounds like a let down, but I'm glad it was a fun read! I think I'd still like to read this, though I'm not as keen now. Thanks for the lovely review, Nina! I think this cover is totally cool. Not my kind of read but I would stop in a shop and actually read the description, all because of the cover. Awesome review! The cover is lovely and it seems like a quick, fun read for the summer. Thanks for sharing. This looks like a fun read but I'm not sure how long I'd be able to tolerate a mopey protagonist for. I'm probably going to end up passing on this. There are too many good books to end up wasting time on an okay read. If the Followers widget isn't showing, you can click here to follow.